The UGA Jazz Ensemble will perform new takes on several jazz classics at 7:30 p.m. on Oct. 4 at Hugh Hodgson Concert Hall. 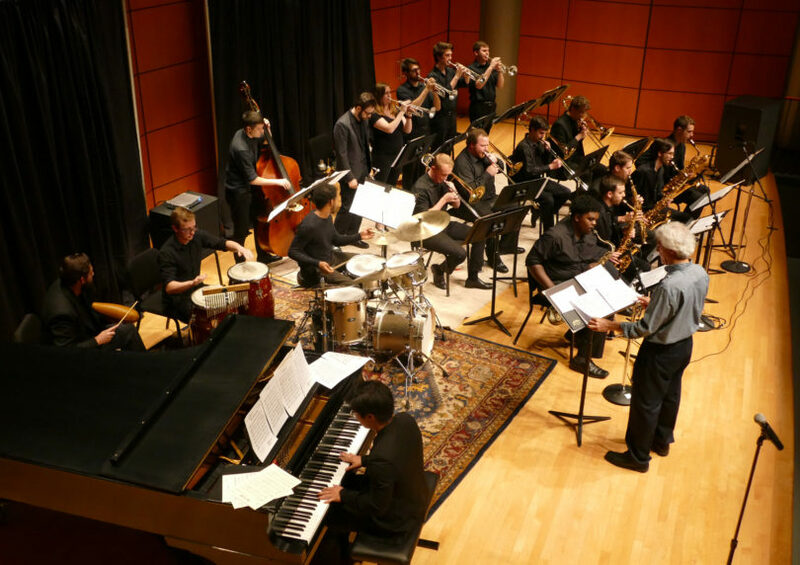 The Hugh Hodgson School of Music will continue its 2018-2019 Thursday Scholarship Series with “An Evening of Hits from the Big Band Era” by the University of Georgia Jazz Ensemble on Oct. 4 at 7:30 p.m. in Hodgson Concert Hall. Led by Dave D’Angelo, professor of jazz studies, the UGA Jazz Ensemble will perform a number of original arrangements from the big band libraries of Duke Ellington, Count Basie, Les Brown, Woody Herman and Tommy Dorsey. “This program will feature the big band hits from the days of ballroom dancing, which are standard literature for every jazz musician, as well as the foundation for all music in this genre that followed,” D’Angelo said. Audiences will recognize “Take The ‘A’ Train,” “April In Paris,” “Opus 1,” “One O’Clock Jump” and many others. “This evening will be one to tap your feet to the familiar tunes from the big band era,” said D’Angelo, who grew up in a musical environment listening to music of this era and playing at a very early age. The program will have guest faculty performers from the Hugh Hodgson School of Music as featured soloists. Professors Brandon Craswell, trumpet, and Connie Frigo, alto saxophone, will join in the musical festivities. Also adding to the evening will be special guest arranger Scott Silbert, former Navy Band saxophonist. D’Angelo said he’s excited for this opportunity for the UGA Jazz Ensemble student musicians to become better versed in this era’s style of music. Tickets are $20 for adults and $6 for students and children and can be purchased at pac.uga.edu, the Performing Arts Center box office or by phone at 706-542-4400. All proceeds directly support student scholarships at the Hugh Hodgson School of Music. The concert also will be streamed live on the Hodgson School of Music website at music.uga.edu/live-streaming.